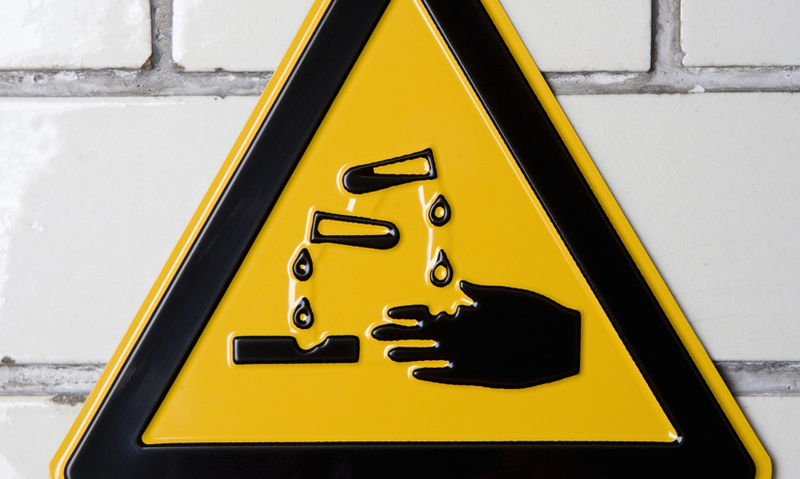 The properties of strong acids and alkalis can be extremely harmful. Where do we find them, and how can we tell how acidic or alkaline a substance is? Bases neutralise acids, and if a base dissolves in water then the solution is an alkali. Weak acids are safe to consume, but stronger acids can be harmful, irritant or corrosive. Acids have a pH of less than 7 and alkalis have a pH greater than 7. Universal Indicator solution can test any liquid to see how acidic or alkaline it is. The taste of lemon juice, vinegar and some fruit and vegetables is sour, because they contain acids. Many other everyday liquids are also acidic. Tea contains tannic acid, and fizzy drinks contain carbonic acid. These are safe to consume because they're only weak acids.